720p and 1080i are both high definition video resolution formats, but that is where the similarity ends. There are differences between the two that may affect the TV you buy and your TV viewing experience. 720p is 1,280 pixels displayed across a screen horizontally and 720 pixels displayed down a screen vertically. This means that 720 horizontal lines or pixel rows are sent to a TV or other display device progressively, or each line or row sent following another (that is where the "p" comes from). The entire image (720 lines or pixel rows) is sent every 60th of a second (or twice every 30th of a second). The total number of pixels displayed on the entire 720p screen surface is 921,600 (slightly less than 1 megapixel in digital camera terms). 1080i is 1,920 pixels arranged horizontally and 1,080 pixels arranged vertically. This means that 1,080 horizontal lines (pixel rows) are sent to a TV alternately (referred to as an interlaced signal). All the odd lines or pixel rows are sent to the TV first, followed by all the even lines or pixel rows. Since a 1080i is interlaced, only 540 lines (or half the detail) are sent every 60th of a second, with all the detail sent every 30th of a second. 1080i produces more detail than 720p, but since the increased detail is only sent every 1/30th of a second, rather than 1/60th of a second, fast moving objects will exhibit slight interlacing artifacts, which can appear to look like jagged edges or a slightly blurred effect. The total number of pixels contained in a complete 1080i signal, once both interlaced lines or rows are combined, totals 2,073,600. However, only about 1,036,800 pixels are sent every 60th of a second. Although the number of pixels for 720p or 1080i screen display remains constant regards of screen size, the size of the screen determines the number of pixels per inch. HDTV broadcasts from your local TV station, cable, or satellite service are either 1080i (such as CBS, NBC, WB) or 720p (such as FOX, ABC, ESPN). However, that does not mean you are seeing those resolutions on your HDTV screen. 1080p (1920 x 1080 lines or pixel rows progressively scanned) is not used in TV broadcasting, but is used by some cable/satellite providers, internet content streaming services, and is a part of the Blu-ray Disc format standard. 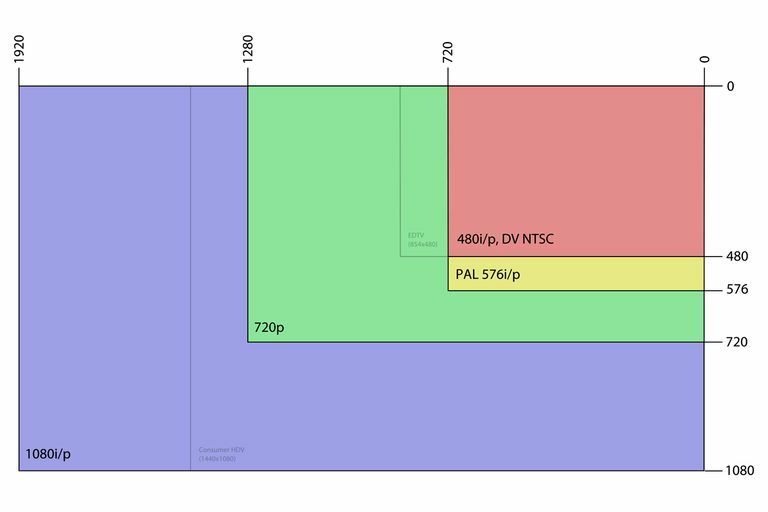 Most TVs that are labeled as 720p TVs actually have a native pixel resolution of 1366x768, which is technically 768p. However, they are usually advertised as 720p TVs. Don't get confused, these sets will all accept 720p and 1080i signals. What the TV has to do is scale the incoming resolution to its native 1366x768 pixel display resolution. Another important thing to point out is that LCD (LED/LCD), OLED, Plasma, and DLP TVs can only display progressively scanned images – they cannot display a native 1080i signal. Plasma and DLP TVs have been discontinued, but many are still in use. If a 1080i signal is detected on one of the above TV types, it has to scale that signal to either 720p or 768p (if it is a 720p or 768p TV), 1080p (if it is a 1080p TV), or even 4K (if it is a 4K Ultra HD TV). 1080p and 4K TVs upscale 720p for screen display. As a result of scaling, the quality of the image you see on the screen depends on the how well the TV's video processor works. If the TV's processor does a good job, the image will display smooth edges and have no noticeable artifacts for both 720p and 1080i input sources. A sign that a processor is not doing a good job is to look for any jagged edges on objects in the image. This will be more noticeable on incoming 1080i signals as the TVs processor only has to scale the resolution up to 1080p or down to 720p (or 768p), but also has to perform a task called "deinterlacing". Deinterlacing requires that the TV's processor combine the odd and even lines or pixel rows of the incoming interlaced 1080i image into a single progressive image to be displayed every 60th of a second. Some processors do this very well, and some don't. Don't get bogged down with all the numbers and tech terms. The main thing to remember is that there is no such thing as a 1080i LCD, OLED, Plasma, or DLP TV. If these types of TVs are advertised as a "1080i" TV it means that while it can input a 1080i signal, it has to scale the 1080i image to 720p or 1080p for screen display. Whether inputting a 1080i signal on either a 720p or 1080p TV, what you end up seeing on the screen is the result of many factors in addition to resolution, including screen refresh rate/motion processing, color processing, contrast, brightness, background video noise and artifacts, and video scaling and processing. With just a few exceptions, 720p TVs have been relegated to 32-inches and smaller screen sizes. You will also find a growing number of 1080p TVs in that screen size or smaller as well but with 4K Ultra HD TVs getting less expensive, the number of 1080p TVs in 40-inch and larger screen sizes are also becoming less numerous.